HAProxy vs nginx Why you should NEVER use nginx for load balancing! Active connections: The current number of active client connections including Waiting connections. accepts: The total number of accepted client connections. handled: The total number of handled connections. Generally, the parameter value is the same as accepts unless some resource limits have been reached (for example, the worker_connections limit). requests: The total number of client requests. Reading: The current number of connections where nginx is reading the request header. 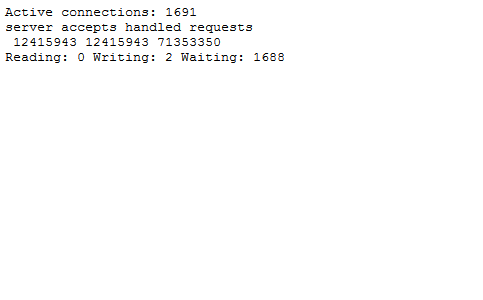 Writing: The current number of connections where nginx is writing the response back to the client. Waiting: The current number of idle client connections waiting for a request. Whenever something goes wonky. First, you open http://www.yoursite.com in a browser to see how bad it’s broken. Second, you open the HAProxy stats page to find what is broken. At this point, you’ve spot the source of the issue 90% of the time.